What a historic night! And I am so proud to have been a part of it. My decision to vote for Barack Obama didn't come easy. When the candidates first started their campaigns...I was a die hard Hillary Clinton fan. I loved her hubby and wanted so much to see them back in the white house. But here was this charismatic senator from Illinois, that I remembered from his key note speech at the Democratic convention 4 years ago. I remembered being moved by his words.....but truly never thought I would hear from him again. So, on November 4th, 2008, I woke up early, got to the polls by 9am, and placed my vote. I am a proud American this morning. I think he will bring about the change that this country so desperately needs. And I pray that all the haters, will at least give him a chance. 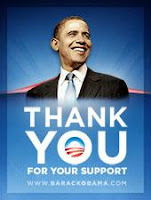 I hope they understand that there is a long road ahead for President Obama. We did not get in this mess over night, and it will take several years to put our country back together again....but I believe "Yes We Can!" I voted for McCain....and had a slightly sick feeling last night when Obama won. I will admit....I got up early this morning, watched part of his acceptance speech last night....and did get a feeling of hope and a feeling that the DOES have the interest and hope of the future of America completely on his agenda. Bri, thank you for having such a positive attitude. I'm sure he will have his struggles, but I believe in my heart that he will do great things!